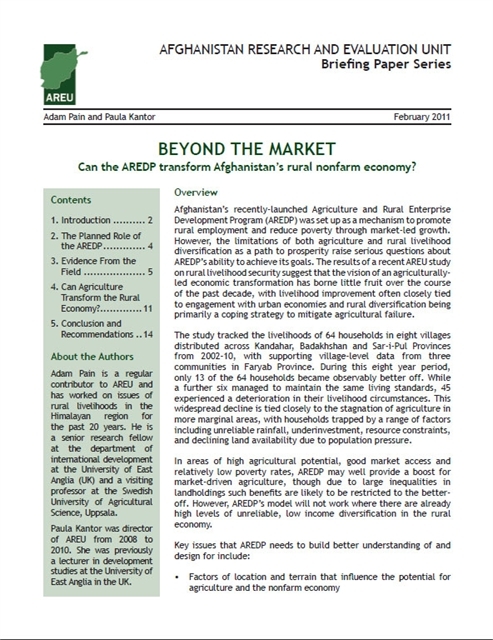 Beyond the Market: Can the AREDP transform Afghanistan’s rural nonfarm economy? The recently-launched Afghanistan Rural Enterprise Development Program (AREDP) was set up as a mechanism to promote rural employment and reduce poverty through market-led growth. However, the limitations of both agriculture and opportunities away from the farm as a path to prosperity raise serious questions about the AREDP’s ability to achieve its goals. 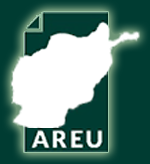 This paper paper draws on the results of AREU’s Afghanistan Livelihood Trajectories study to examine these issues. The general decline in household livelihood security it observed suggests that the vision of an agriculturally-led economic transformation has borne little fruit over the course of the past decade. In the few households that prospered, livelihood improvement was often closely tied to engagement with urban economies and links to patronage networks. For the majority that did not, rural diversification was primarily a coping strategy to mitigate agricultural failure, rising food prices and income loss from the opium ban. While the AREDP may boost market-driven agriculture in already productive areas with good access to markets, it is unlikely to achieve the kind of generalised transformation of Afghanistan’s rural economy that it hopes for. If it is to achieve its stated goal of reducing poverty, the programme must do more to test its underlying assumptions regarding community solidarity and market competition, as well as taking greater account of local and regional contexts. It must understand that poverty alleviation is not simply a secondary product of market development, but an end in itself.